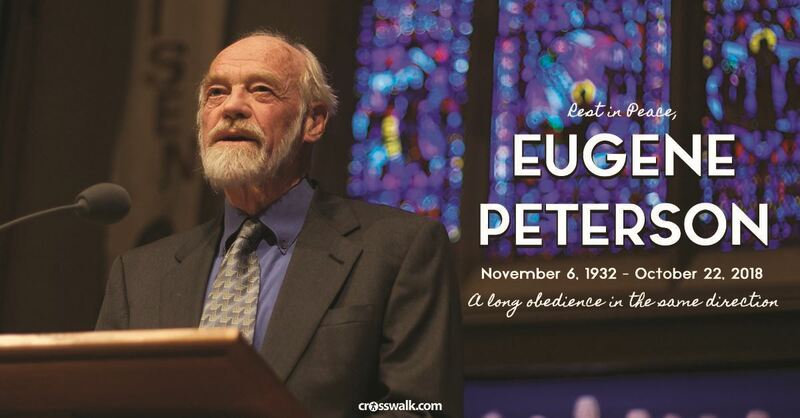 Editor's Update: Eugene Peterson passed away on October 22, 2018, having completed his long obedience in the same direction. He will be greatly remembered and missed. It has been announced that Eugene Peterson, author of the bestselling The Message and longtime pastor, who Christianity Today lovingly referred to as the “shepherd’s shepherd,” will be entering hospice care and receiving palliative care. Our hearts and prayers are with him, his family, and loved ones as they walk through these days. May God’s presence and peace be so very close to them; may they feel comforted by His Spirit and know how much they are loved. According to a note from his son Eric last week, Eugene Peterson was hospitalized this past Tuesday, October 9th, when “he took a sudden and dramatic turn in his health caused by an infection.” The elder Peterson had also been dealing with dementia and congestive heart failure, both of which are reported to be progressing. 1. You are deeply loved. 3. We are going to try to help make these remaining months as comfortable and enjoyable for you as possible. (To which he gave us his million dollar smile and said, “thank you.”)"
Eugene Peterson on death: "I'm not afraid." As any of us who have read Eugene Peterson’s books over time or listened to his messages know, his life is a life well-lived, full of grace, prayer, and great wisdom. We are grateful for his service to Christ and his words that have encouraged so many. “Eugene Peterson has encouraged, formed, and often literally saved the ministry of more than one pastor over the years through his writing and thinking (I would include myself in that list). He has refreshed Scripture for many through his thoughtful paraphrase of the Bible published as The Message. It is time for those who have benefited from his ministry to return the favor to him and his family with prayer over the next several weeks.” Peterson has written an entire series of books on prayer, including his first in the series, Praying with Jesus: Year of Daily Prayer and Reflection on the Words and Actions of Jesus. 2. Peterson wrote "The Message: The Bible in Contemporary Language" as well as over 30 other books on faith, life, hope, and God’s word. Eugene Peterson left words and words, books filled with words and messages of hope, for our world to still pore over, to ponder, to help strengthen our faith and our walk with Christ. The Message has meant so much to me personally over the years. I’ve read it next to the version of the Bible I normally read, and it’s helped me to better understand and grasp meanings of the scripture that may have been missed if I was just quickly reading through. 3. Peterson's life has been a constant testimony of God’s grace and love. He cared about people. He loved. He shepherded. He taught. He preached. He wrote. He encouraged. He challenged. He carried. He prayed. He supported. He inspired. He believed. He listened. He stood. He stood strong, for His Lord and Savior Jesus Christ. 4. He has faithfully served the body of Christ. Eugene Peterson was a founding pastor of Christ our King Presbyterian Church in Bel Air, Maryland where he served for 29 years. He also served as Professor of Spiritual Theology at Regent College in Vancouver, British Columbia until retiring in 2006. 5. He has reminded us that spiritual theology is a way of life. 3. “Sabbath is that uncluttered time and space in which we can distance ourselves from our own activities enough to see what God is doing.” – The Pastor’s Sabbath, Christianity Today. 5. “We cannot be too careful about the words we use; we start out using them, and they end up using us.” – Quoted by Krista Tippett during her interview with Peterson on the podcast On Being.